Sorry for the late update as I was enjoying my trip…Now, I am back on track again! I have two girl friends crazily obsessed with color-block style shoes and have many pairs of such shoes for all seasons in their closets. When I saw a few color-blocked shoes on-sale at Milanoo.com early this morning, I thought of the girls immediately. The shoes look fabulous and fit those who like bold colors. Besides, color-block fashion is definitely one of the hottest trends this summer. Then it occurred to me that it might be a good idea to pick some statement pairs in case some of my readers are interested in. In order to find the best-valued color-block shoes as well as dresses, I scoured all online shops I am familiar with. Below you will find my picks from a few popular shopping websites, including Milanoo.com, Lightinthebox.com, Dinodirect.com and Aliexpress.com. The four stores seem to be never missed out when I talk about fashion products offered direct from China. If you want more detailed information about any of them, you can search related reviews at this site. Color Block Criss-Cross Cowhide Women’s Clogs, $40.99, available at Milanoo.com, click here for details. Hollow Out Color Blocking Platform Sandals, $34.99, free shipping, offered by a seller with high positive feedback score at Aliexpress.com, click here for details. Aliexpress.com is one of the best wholesale transaction websites in the world. It provides escrow service to ensure that the transactions made between sellers and buyers are fair and safe. They charge no service fees on buyers. Then how do they make money? No secret: they have already added a certain percentage of commission to each price set by the sellers. However, the site is still the best place to find products that are for sale at the lowest prices possible. I got over 160 results for color block shoes at the site, see all styles available here. Folded Collar Patched Color-block Women’s Dress, $8.99 for anniversary sale, free shipping, available at Dinodirect.com, see details here. Dinodirect.com has too many styles for each subcategory of dresses. Unfortunately, the search function of the site is not a user-friendly one. If you want to discover the dresses of your desire there, you may have to spend hours browsing the pages of the catalog. Anyway, the time is totally worth considering that the site always offers very attractive prices with free shipping worldwide. 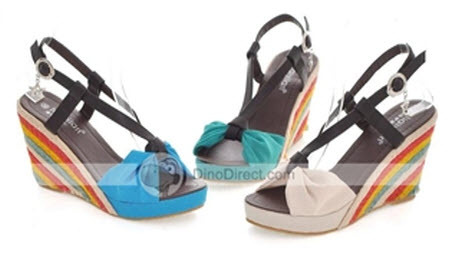 Meanwhile, Dinodirect has a wide range of color-block shoes for this summer. Although some of the shoes are not the latest styles for summer 2012, you may still find it hard not to order them as they are really classic and beautiful. Oh, one thing is worth mentioning: Dinodirect is well-known for selling authentic brands so you don’t have to worry that you will get any fakes from this Chinese supplier. As a big name in the international trade arena of quality and fashionable fashion, Lightinthebox.com carries a good collection of color-block dresses, priced at between $20 and $50. The bold colors and creative combinations of colors are intended to refresh your wardrobe! Click here to see all styles. It is a pity that I fail to find any great color-block shoes at Lightinthebox. In fact, I seldom recommend shoes offered by the site as I know they are best at making dresses, especially wedding dresses and other special occasion dresses.